-switch Surface Tab to “Presets”, go to “shaders” and apply “!Iray Uber Base“. -switch the Surface Tab back to “Editor”. –make sure “Base Color” is set to white for all materials. –make sure the sky textures in “Base Color” are still there. —load the same textures to the “Emission Color” channel ( texturename_north to the north surface etc.). Daz Studio has the textures already loaded, so it should be easy to find them in the popup list. —select all skybox materials again, set “Emission Temperature (K)” to around 6000 (lower values add red tones, higher values blue tones). —set a value for “Luminance“. At the preset Units you need a very high value. You can change the “Luminance Units” to cd/cm^2 and set a “Luminance” value of about 5 if you prefer smaller numbers. Now your skybox should look very similar to the 3Delight version. -Under Render Settings you might want to turn “Draw Ground” off (Environment/Ground). -Render Settings / Environment mode can be “Dome & Scene” or “Scene Only”, it doesn`t really matter since the skybox obscures all light from the Iray dome anyway. -Render Settings / Tone Mapping / Exposure Value can be used to brighten or darken the whole scene. The lighting from your converted skybox will likely not be perfect. Rather than changing the skybox scale I`d first try to add an extra sunlight though. In general I think first you should ask yourself if you really need Iray for the scene you want to do. The look of the skybox itself doesn`t change. Switching to Iray might also require conversion work on other materials in the scene, e.g. the terrain if you work with an old Easy Environment set. It`s entirely situational, just saying, sometimes simply sticking to 3Delight might be the better choice. Just to mention this, since it often comes up. 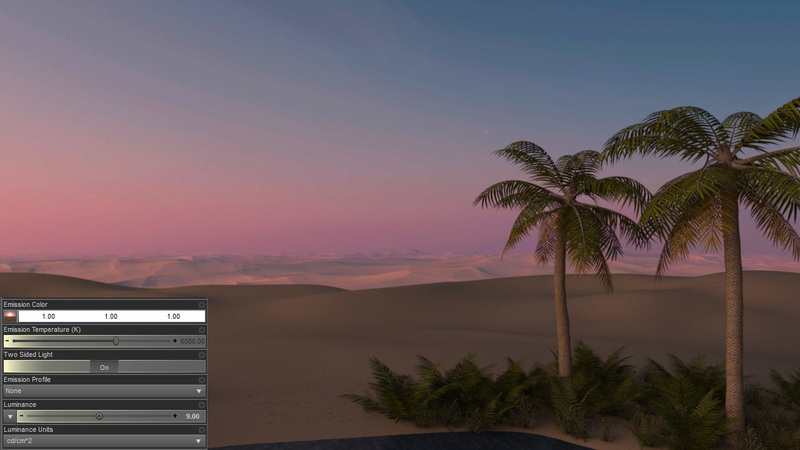 Make sure to hide or delete the skybox which loads with the older Easy Environments scene. Otherwise the skybox will block the line of sight towards the (bigger) HDRI Iray Sphere, also blocking the lighting, resulting in a black scene.